Fighting Heat with Heat — Szechwan Style! To help you endure the torrid days ahead, Ho Kyung Jeon presents China's most famous Szechwan-style cuisines. The fiery flavors will set your taste buds aflame and stimulate your appetite! Contrary to popular beliefs, in order to cool down your body during the sweltering summer months, you must indulge in a lot of steaming hot and spicy foods. This has long been the tried and true concept behind Chinese medicine. This month, Ho Kyung Jeon tempts you with a variety of dishes bursting with the searing flavors of hot sauce and red peppers. 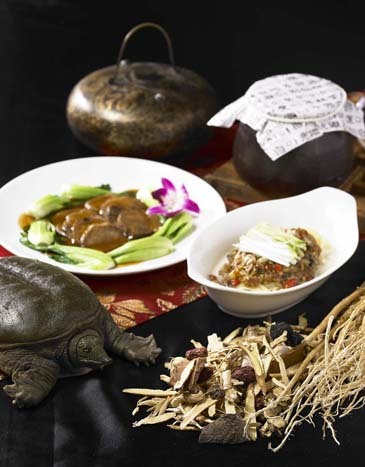 Our delicious Lunch Set Menu includes Ginseng and Shark's Fin Soup, Braised Garupa with Chinese Hot Sauce, and the renowned Chinese Hot Pot – Special Noodles with Assorted Mixtures, Szechwan-style. Or try our more extensive and succulent Dinner Set Menu, featuring Braised Ox Tendon with Hot Sauce, Szechwan-style Shabu Shabu, and Sautéed Pork Belly and Vegetables with Hot Sauce. Come and share this sensational feast with your special someone, and experience the amazing flavors and quality of these authentic Szechwan-style cuisines!